My main complaint is that there isn't enough of itclever puzzles, shooting, and platforming have zero fat, and make its four hours fly by. What is it? A cooperative, top-down puzzle game with twin-stick shooter and platforming elements. I never finished Lara Croft and the Guardian of Light because I feared that I'd be missing the point if I didn't play it cooperatively. 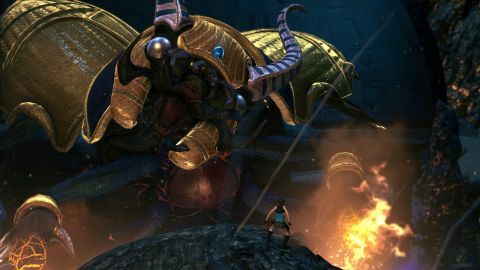 The sequel, Lara Croft and the Temple of Osiris, which now has four-player co-op, is definitely more fun with a friend, but its mix of twin-stick shooting, platforming, and environmental puzzles are worth playing with any number of players—even alone. It holds to the formula of the original. Lara and rival treasure hunter Carter Bell are raiding a tomb in Egypt when they accidentally awaken ancient gods. The good ones, Isis and Osiris, join Bell and Croft as playable characters to stop the bad ones, Set and his cronies, from destroying the world. Isis and Osiris have staffs that fire magic laser beams to damage enemies, explode priceless pots real good, and manipulate different objects in the environment. They can raise magic platforms, slow down time, or form a sphere other characters can jump on to reach higher ledges. The simple mortal characters bring their mines to table, as well as guns and a grappling hook, which is always plenty magical to me. Every puzzle or enemy is overcome with some combination of these abilities. As much as the 1996 Tomb Raider was about pushing big cubes, the Lara Croft games are about rolling giant balls. At some point, fellow PC Gamer writer Ian and I tried to get one of these giant, exploding balls up a series of ledges. As Isis, Ian used his magic staff to slow the bomb's timer while I put down mines that, when detonated, would bounce it up the ledges. That was definitely the solution, but it took us knuckleheads several attempts to execute. We were a little too loose with the explosives, making the ball and ourselves bounce off the walls and into bottomless pits. I probably killed Ian more times than any boss in the game. Eventually we stumbled through it by placing even more mines, hoping for the best, and pushing the ball every which way. It was messy, and funny, but it worked. A lot of cooperative modes simply put two players in the same game, which is fine, but here I really feel like my friend and I are working together when I throw a rope and pull him up, or he holds on to it while I swing and grab a hidden collectible. Other puzzles require more accuracy and may cost your friend a life if you mess up, and I particularly enjoyed any puzzle that incorporated the grappling hook (I'm really into grappling hooks, OK?). Every puzzle is some combination of these elements: grappling hooks, balls, mines, switches, and pressure plates. However, the combination is always clever and new. What's most impressive is that these puzzles change their design depending on the number of players. A puzzle that required two players standing on two different pressure plates would simply drop a ball into the level when I played it alone, and when alone Lara also got the magic staff and the grappling all to herself, and so on. Again, it's much more fun with a friend, but I played a fair bit of it by myself, and it was still a lot of fun. No matter how the puzzles were arranged, I always felt smart when I solved them, and they never took long enough for me to get frustrated. Temple of Osiris is a far better twin-stick shooter than I expected. Rather than just stick to Lara's signature twin pistols, I slowly earned assault rifles, sniper rifles, and rocket launchers. No weapon was clearly better than the next, but their different reload times, splash damage effects, and other stats gave combat different rhythms. It was great to have choices, and discover that I liked using dual submachine guns with an ice effect against the big fiery crocodile man, while I could take out swarms of beetles with a single rocket. One constant that I loved was the move where I'd fire, place a mine, roll out of the way, and detonate it when an enemy got close. Boss battles, too, made for interesting set pieces, especially the one where I fought a giant beetle on top of a rolling, burning sphere. Lara Croft and the Temple Osiris looks great, and moments like this, with fantastic lighting and depth-of-field effects, really help give it a sense of scale even though the camera is stuck in the isometric perspective throughout. The visual vocabulary is all pulled from the same reservoir of Egypt-themed clichés—pyramids, half-crocodile half-man enemies that look like they came out of Donkey Kong Country, palm trees—but at least it's not committed to a sandy yellow palette. It mixes things up with mossy dungeons and even some snowy areas thanks to some plot contrivances (magic!). I also just like how it looks and sounds when I shotgun a big bug in the face; I enjoy simple pleasures. However, you better be doing all of this with a gamepad. It works with a mouse and keyboard, but that makes platforming more difficult than it should be. Even worse, since it's a shared screen, even online, the camera keeps adjusting to accommodate both players. It's kind of jittery, but especially annoying when aiming with a mouse, since the camera moves the reticle, screwing up my aim. I just like how it looks and sounds when I shotgun a big bug in the face. It took me about four hours to finish Lara Croft and the Temple of Osiris. It's brief, but not a bad deal for $20, and it also extends its lifespan by giving each level a number of challenges—finish under a certain time, collect enough diamonds, don't get hit by the boss, and others. After I beat the game, I could go back to 100 percent levels or take on waves of enemies in combat trials. It's fun, and it unlocks a surprisingly large arsenal of weapons, outfits, and jewelry that modifies weapons with different bullet spreads, more ammo, and ice or fire effects. Seeing Osiris in his Egyptian headdress with a grenade launcher is a special treat. As someone who suffers from a severe completionist disorder, it helped me wring a couple more hours out of Temple of Osiris, but the real joy is in beating levels with friends for the first time, and there's still only four hours of that. I always prefer a game that leaves me wanting more to one that wears out its welcome, but Lara Croft and the Temple of Osiris cuts off before its ideas are fully developed—I didn't solve enough permutations of its puzzles and shoot enough bugs in the face to feel fully satisfied, and once I finished it, I didn't see enough of a reason to go back. That said, I liked it a lot for as long as it lasted. Grappling hooks and swinging are two of my favorite things in games. Kill enough enemies without being hit and you'll trigger a power-up. Lara doesn't know how to stop, drop, and roll. Lara Croft and the Temple Osiris has a lot of balls, but this is the biggest. It really nails scale sometimes.